Have been inspired this week to enter a bowl confidence pool. Crazy to try to predict bowls, we understand, but better our numbers than nothing, right? Well, we’ll see. We like that it’s confidence-based, and a reasonably big sample. And we like that it will add some flavor to the holidays. The usual details apply. These numbers don’t know if a coach has been fired, or is coaching his last game, if players have announced for the NFL or simply have their give-a-damn broken. They almost certainly should be regressed toward 0 given there is so much more uncertainty than a typical CFB weekend. For that reason you should be careful betting sides with them, especially favorites. You might also want to blend them before getting too cocky about your edge. We recommend the market, this year at about 50/50. Enough caveats. We’re putting this baby straight into our pool. How would we measure player give-a-damn anyway?! 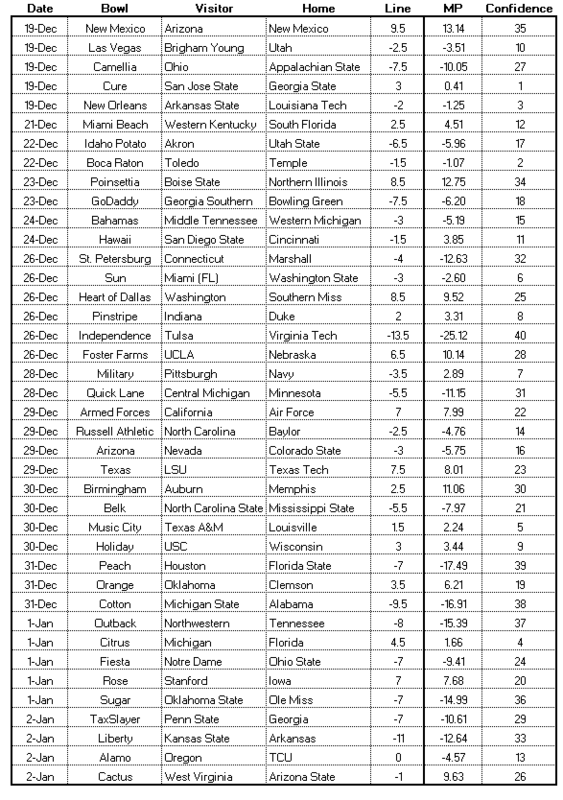 Below are our spreads for each of the 40 games. I’m including our line and confidence ranking for each game, as well as the market line as of last night (12/15/15, covers.com). Lines are in terms of the “home” team. Confidence is about picking the games straight up, so is simply the rank of line absolute values. 40 means most confident outright winner pick, 39 is next most confident, etc. Pardon while I just drop them in as an image like it’s the ’90s. Birmingham Bowl (Auburn/Memphis) – Do you believe in priors? We do, which means we really like Auburn in this game. But if we threw those out we’d be right on top of the line, since Memphis has greatly exceeded expectations and Auburn greatly disappointed. It would be hard for priors to make a bigger difference than they do here. Outback Bowl (Northwestern/Tennessee) – We’ve been saying all season that Northwestern is over-rated and Tennessee under-rated. Could not be more delighted that they end up on opposite sidelines on New Year’s Day. Texas Bowl (Texas Tech/LSU) – Everyone’s talking about Fournette against Tech’s defense, and we agree that is must-see TV. But as a bonus you get a very solid SEC defense (#12) against the nation’s #3, playing a style the SEC mocks and the Big 12 claims is under-rated. Should be hugely entertaining. That’s what we have for now. Hope this helps in some way. Soak up the games!